Best purchase! I LOVE this item! It keeps my wrists and neck from hurting because it sits below my desk. It is adjustable to your comfort level. It is heavy and difficult to install but well worth it. 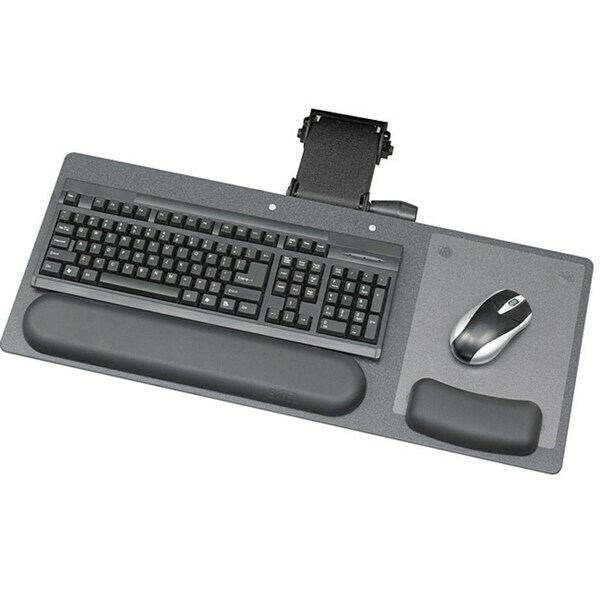 With multiple adjustment options, this keyboard and mouse arm can be made into a customized fit for anyone. This office accessory makes a great addition to any computer desk. It's heavy. It's a little complicated to put in. I am completely happy that I did get it. I have two sets of keyboard/mouse combinations. One for my main system and one for my secondary systems. Now everything is more organized, and I have more desktop space. Excellent product. Well built and sturdy. Came fast and undamaged. Just like pictured. Only problem I had was due to me measuring wrong. Had to return it for another one in the right size. "ITEM# 12580844 Is it made from plastic or metal? what is the shipping price to Israel? Thank you Lisa Apr 14, 2016"
You will be contacted by Customer Care. Have a great day. "is therea model with the mousepad on the left side?" Thank you for contacting us quimbaya. Unfortunately no, we apologize for any inconvenience we might have caused. Please let us know if you have any further questions.